Our name is taken from the small Victorian suburb of Spring Grove in Kingston-upon-Thames where we practise; it lies just south of Kingston Old Town and across the Hogsmill River. A fun evening of dance song and tunes in the Spring Grove Pub with friends from Ewell St Mary's Morris Men, Phoenix Clog and singers from the Pielarks. Kingston Spring Grove Morris put up a team of men in Spring Grove Morris colours and in Kingston colours we had women (with occasional appearances by the Squire David and Laurie). The pub was packed and had cleared the front for our use. 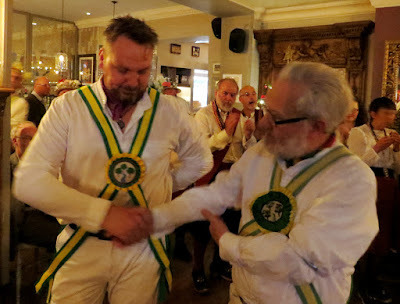 We took turns to dance or sing then David presented Id with his baldrics; Id had danced in two years earlier, but a hiatus in making rosettes made this an unusually late presentation. We support Princess Alice Hospice which provides end of life care, and we will continue to support St John's Church. All About Alie. The Charities page has a list of previous years' good causes. 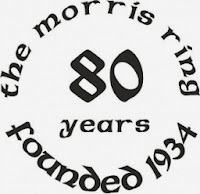 We are members of The Morris Ring, founded in 1934, an association of Morris, Sword and Mummers Sides, Clubs and Teams who keep our wonderful traditions alive. "The troop, called the Spring Grove Morris Men, looked so quintessentially English that I thought that they could be a nice addition to our wedding." Loulabelle's wedding blog.